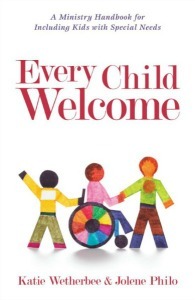 Many of the concepts in this workshop are also discussed in Every Child Welcome: A Menu of Strategies for Including Kids with Special Needs written by Katie Wetherbee and Jolene Philo. These workshops are designed to provide a complete two day training for church children’s ministry staff and volunteers or other groups interested in launching a special needs ministry. Or churches can choose a few of the workshops that best meet their needs. All of us carry unresolved trauma from childhood into our adult lives. Often we don’t realize they’re there until we become parents and discover our kids can push our buttons like they’ve never been pushed before. This workshop begins with a look at the parts of the brain and how memories are formed. It then explores the components of the Instinctual Trauma Response model and how it explains unresolved trauma (aka: hot button issues) in children and adults. The remainder of the time will be spent exploring how unresolved trauma negatively affects our responses as parents and how to respond in positives ways instead. Childhood developmental trauma is a reality for kids with special needs in foster care. To advocate effectively on their behalf, foster and adoptive parents must understand how trauma affects children from before birth and throughout childhood. The first half of this workshop debunks popular myths, examines the connection between childhood trauma and RAD, and discusses how trauma affects children’s brains. The second half of the workshop looks at causes and symptoms of PTSD before reviewing effective methods of treatment and prevention. Participants will receive an extensive resource list and are encouraged to participate in the question and answer period at the end. This workshop explores the impact of invasive medical trauma in very young children. Participants will learn to differentiate between trauma and PTSD and learn how children remember early medical trauma. Risk factors for and symptoms of early onset PTSD are identified and effective prevention and treatment methods are examined. Participants are encouraged to participate in the question and answer period at the end.